The USDA approved and certified continuous mixing processor line has an all-stainless steel design and can be fully disassembled for cleaning. 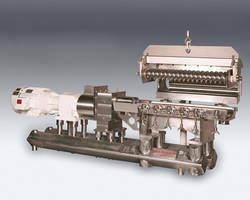 The line is ideal for the food, beverage and pharmaceutical markets. York, PA: Process equipment manufacturer Readco Kurimoto, LLC, York, Pa. (www.readco.com), has unveiled a line of sanitary, continuous mixing processors. Offering the company’s proprietary continuous mixing technology in a sanitary design approved and certified by the USDA, the Readco Continuous Processors feature solid, one-piece, removable, rotating shafts that cannot harbor material with removable end plates and Tri-Clover feed and discharge connections as standard in an all-stainless steel design. The sanitary processors can be fully disassembled for cleaning by one person in minutes and thrive in chemical washdown conditions. The sanitary continuous processors are custom-engineered for each application based on laboratory testing using customer materials and formulations to verify performance. The continuous systems are manufactured in the company’s York, Pa. headquarters and are delivered assembled, fully tested and ready for operation. For a free brochure or more information, contact Readco Kurimoto, LLC, 460 Grim Lane, York PA 17406; 800-395-4959; or see www.Readco.com.